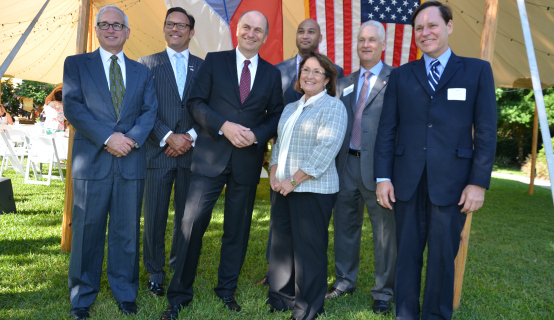 Orange County Mayor Teresa Jacobs joined the Orlando Consular Corps to welcome Petr Gandalovic , the Czech Ambassador to the United States, during his official visit to the Central Florida region. The gathering was held recently at the Winter Park-based Polasek Museum and Sculpture Gardens, which is the former lakeside home of the famous Czech sculpture Albin Polasek. Speakers paid tribute to the many thousands of Czech citizens who have enriched the American culture. The historic museum in Orange County was listed on the National Register of Historic Places in 1949. Ambassador Gandalovic visited the region from Washington for several days for business and cultural exchange opportunities. He highlighted Orange County’s strong commitment to arts and culture and congratulated the region on the opening of the Dr. Phillips Center for the Performing Arts. Several Consuls attended the event, including representatives from Mexico, Haiti, the Czech Republic, Switzerland, Germany and Austria. Both Mayor Jacobs and Ambassador Gandalovic reflected on the cultural connection and storied history between their countries. “We have a solid relationship between two countries that share allies,” Ambassador Gandalovic said at the event. The Ambassador expressed his sincere thanks to the Polasek Museum trustees for their role in resurrecting a President Woodrow Wilson statue in Prague. The statute, originally created by Albin Polasek, was first constructed in 1928 to honor President Wilson for his role in creating an independent Czechoslovakia after World War I. The Nazis destroyed it in 1941, and several brave Czech citizens kept the mold for the head and shoulders hidden for decades. A replica bronze statute was created by artists calculating the proportions from the original sculpture and the new monument was dedicated in 2011 on the platform of the train station also named for Wilson. The statue is one of the few of an American president on foreign soil. Mayor Jacobs is focused on growing Orange County’s economy by expanding relationships and business opportunities through local and international partnerships. She recently commemorated the one-year anniversary of the Central Florida International Trade Office (CFITO) and its success assisting businesses with international prospects and commerce opportunities. CIFTO is funded by Orange County with a dollar-per-dollar match from JP Morgan Chase and is located at the National Entrepreneur Center (NEC). A collection of photos from the Breakfast with the Czech Ambassador is available for use by the media and are located on Flickr.